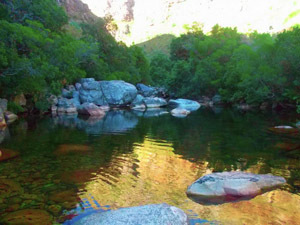 The Elandspad river in Du Toit’s Kloof is one of those mind-blowing rivers that will see you returning for more, again and again. Populated only by rainbow trout, the extent of the water inhabited is substantial. The average size of fish is between 10 and 12 inches, depending on the beat, but fish longer than 20 inches have been taken as high as Beat 4. 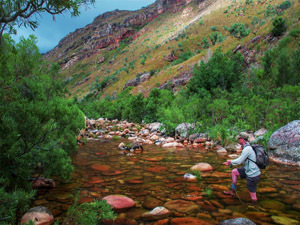 Due to the distances covered to reach and fish the higher beats, the fish there are less pressured and thus appear to be more gullible than the rainbows in the lower kloof area, which at times can be frustratingly picky. The higher reaches of the Elandspad demand fitness to be able to reach and fish comfortably in a day. This premier, but technical, trout stream offers anglers a large variety of water. Ranging from large pools and pocket water, to shallow, long runs. Fishing on the Elandspad is known to be technically challenging at times, yet anglers who have visited it once, battle to stay away for too long. Access to the Elandspad beats is controlled by Cape Nature and the CPS and permits are required for both members and non members alike. As with all CPS rivers, there is a strict no take limit (catch and release only) and all fishing is to be done with fly tackle and barbless hooks only. Beat 1 on the Elandpad consists of large pocket water, shallow runs and two weirs, with the potential of some quality fish. Fish on this section are known to be particularly fussy at times, but their size makes up for their picky behaviour. Small dries (#16-18), and nymphs, will yield the best results. But fish delicately and slowly. Fish the whole beat from above the confluence with the Smalblaar up to the large pool above the high (second) weir. The catwalk ladder can also be observed on the steep left bank (facing upstream). This is the end of Beat 1. Traveling east from Cape Town, 250m from the exit of the Huguenot Tunnel, pass under a large bridge over the N1 then turn right into the small side road as the N1 splits to two lanes (Figure 1). The side road terminates at the parking area near the weigh-­bridge. Starts at the end of the Elandspad River at its confluence with the Smalblaar. The pool at the confluence (Junction Pool) is NOT part of the beat. Ends approximately 830m from the start, at the head of a long pool with a sheer cliff on the left (facing up stream). Please select this link to download the detailed instructions: Elandspad Beat 1 detailed instructions. Beat 2 starts above a long pool that is the end of Beat One. From here you will find some of the best water on the entire river, which is made up of shallow runs and deep slots between biggish pools. 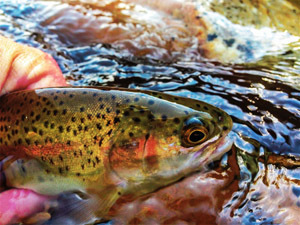 The runs offer challenging drifts over skittish trout that can be frustratingly selective. Due to the wary nature of fish on this stretch (and most of the lower Elandspad for that matter) the best approach is to fish slowly and to cover the water well. If you get to the end of the beat in a couple of hours, you have fished too fast. The beat ends where the gorge narrows down steeply and the marker of Beat 3 can be seen on the right-hand side of the river. Travelling east from Cape Town, 250m from the exit of the Huguenot Tunnel, pass under a large bridge over the N1 then turn right into the small side of the road as the N1 splits into two lanes (Figure 1). The side road terminates at the parking area near the weigh-bridge. 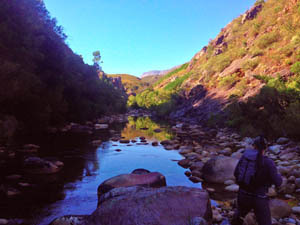 Starts at the end of Elandspad One (EP1), at the head of a long pool on the upstream side of a shear cliff on the left bank (facing upstream). The pool below the cliff is NOT part of the beat. Ends approximately 680m from the start, where a green fish painted on a large rock on the left of the river (facing upstream) (Figure 7). The water above the painted fish is NOT part of the beat. After about 30 minutes of walking and a decent down a steep mountain side for about 100 meters after the catwalk, (which must be negotiated with care) you will reach the start of Beat 3. Fish all the shallow pockets that lead up too a long shallow pool. After this point there are several large pools that may need to be bypassed, especially in high water. Bypass these pools on the left (facing upstream) and continue fishing until the cave pool (the cave is visible on the left) which marks the start of beat 4. Then follow the path, which starts on the left of the cave, back to your car. Beat 3 is a long beat, and needs to be fished at a steady pace, as there is no easy exit once you are on the beat. Also keep in mind that the walk back will take about an hour, so leave in sufficient time to get back to your car before darkness sets in. Remember that the weather can change for the worse very suddenly so always carry the necessary protective clothing and a space blanket. But don't let this put you off, the fishing on this beat is fantastic. Starts at the end of Elandspad Two (EP2), where there is a green fish painted on a large rock (Figure 9). The water below the painted fish is NOT part of the beat. Ends approximately 1.2km from the start, at the cave pool (cave on the left facing upstream). The level pool water is NOT part of the beat. Beat 4 starts at the cave pool, which cannot be missed if you follow the hiking trail from the parking area. Expect to be on the trial for at least 40 minutes before reaching this point. From here fish the runs and pocket water all the way up to a massive pool in the middle of the beat. This pool holds some very large and very tricky fish, and is impossible to wade through. To continue fishing beat 4, follow the path on the right (facing upstream) to get to the water above the pool. From this point onwards, you will find some of the finest fishing on the river. Although most of the fish are smaller than on the lower beats, the long runs and thin pocket water provide opportunities for some amazing sight fishing. A small tributary, the Kraalstroom, that joins the Elandspad from the left (facing upstream) marks the end of the beat. The hike back is slow and can take up to 2 hours, so keep this in mind when planning your fishing. Elandspad Four and Five have been combined into one beat, Elandspad four, as of September 2014. One cannot book the beats separately. Starts at the cave pool (cave on the left facing upstream) (Figure 9). The rapids below the level pool water are NOT part of the beat. The beat ends beyond the confluence with the Kraalstroom (GPS: S33 45.552 E19 7.654) when the river becomes unfishable.